I remember the first time I met her. I was four years old. When she saw me, she wrapped her arms around me in the biggest hug. She hugged me as if I had been lost and she finally had me back in her arms. 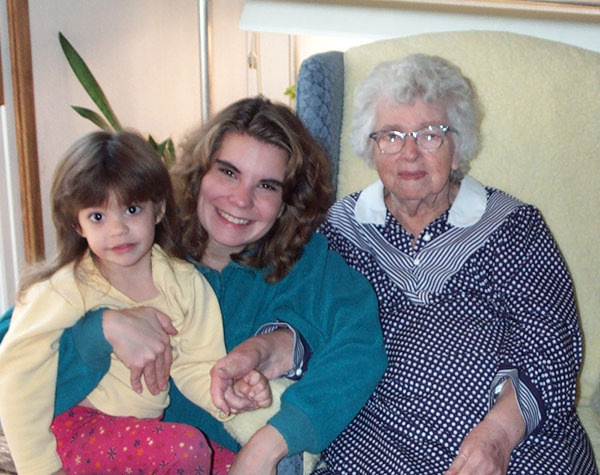 My Grandmother was a great example of Christ’s love. Although she had 8 children of her own, she took in different nieces and nephews when times were rough during the Great Depression. Her home was ‘marked’ by Hobo’s as a home that would kindly give you a meal if you needed it. Her home was always open to those in need. She never had much but she always was willing to share what she had. My own life holds examples of loving kindness and acceptance that she showed me during my growing up years. As a teenager trying to understand my past her unconditional love anchored me and her prayers sustained me. Her quiet ways showed me what it meant to live as Christ’s hands and feet in the world. Her love was God showing me who I was and to whom I belonged. She is part of my faith story. Today in church, we are celebrating “All Saints Day.” Saints are people who have been “set apart” for God’s holy / special purposes. On this day, as a church community, we remember all the believers in the family of God that have gone before us. Saint Peter, Saint Paul, and others that we read about in the bible as well as the many other men and women of God who were disciples of Jesus Christ down through the ages, . . . like my grandmother. Although sometimes still feel like that small, insecure child, the stories I read in the Bible assure me that I am part of a bigger family. The Bible is like my family album. It tells the story of great men and women of faith in the family of God. It reminds me who I am, and whose I am. As a believer in Jesus Christ I am part of the family of God and I can claim these great stories of Abraham, Moses, Esther, Peter, James and John, all of them, as part of my faith family. Heavenly Father, thank you for the examples You have sent us to show us Your love in the world. Help us to follow their example/ and show Your love to those we meet. Amen.